As with more traditional light sources, the colour temperature of an LED will dictate whether it emits a warm or cool light. The higher the LED’s colour temperature, the cooler the resultant light effect. So, a cool white light has a colour temperature of 4000K, whereas a warmer light effect will have a colour temperature of 2800K. The colour temperature of a light source is taken from the temperature of a perfect black-body radiator that radiates light of a similar appearance to that of the light source. It is measured in units of absolute temperature; Kelvin (K). Interestingly, although red is associated with being a hot colour and blue a cold one, on the black body curve (also known as the Planckian Locus, see diagram 1), blue occurs at higher temperatures than red. A more visual example of this apparent colour temperature contradiction can be seen in candlelight, which emits a warm red orange glow, but in fact has a low Kelvin temperature of 1850K. 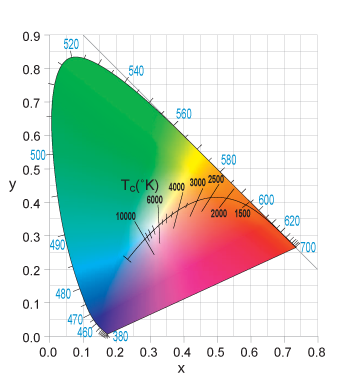 Therefore higher colour temperatures (5000K more) are called cool colours (bluish white); lower colour temperatures (2700 – 3000K) are called warm colours (yellowish white to red). 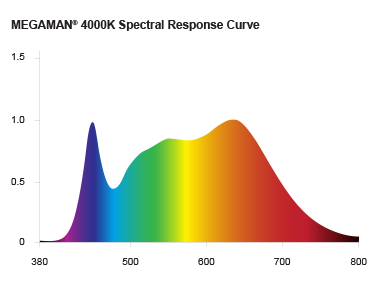 LED and discharge lamps have negligible thermal radiation, so do not follow the form of a traditional black body spectrum. However, as with any colour, they can be represented on a so-called ‘colour space’ using the CIE 1931 (x,y)-chromaticity diagram (see diagram 2). Every colour is uniquely defined by one (x,y) point in this space. The colour points of thermal radiators lie on one curve in this space, the black body locus. The colour points of LED and discharge lamps for general lighting are located outside, but close to, this curve. Although a colour temperature can only be attributed to points on the black body locus, these light sources are also assigned a colour temperature: correlated colour temperature (CCT). The CCT is the colour temperature of a black body radiator which, to human colour perception, most closely matches the light of the source i.e. the point on the black body locus that lies closest to the colour point of the source. The key to creating an LED lighting scheme, that looks good for years to come is in ensuring that, over their lifespan, all of the lamps are performing within an acceptable tolerance in terms of colour deviation. 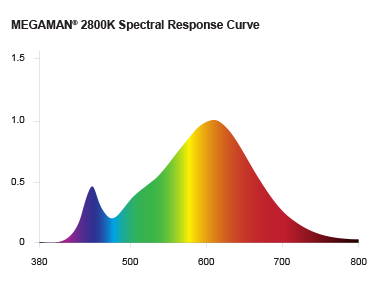 To define ‘acceptable tolerance’ from lamp to lamp, LED manufacturers have adopted the MacAdam ellipse and SDCM (Standard Deviation of Colour Matching) measurement of colour consistency. The MacAdam ellipse is a system of colour measurement. It measures how much colour variation is possible around these axes, before the human eye detects a colour change. A series of ellipses can then be drawn around any target colour, and the closer any given lamp is to the target, the less colour deviation will be experienced when these lamps are placed side by side in an installation. The distance from the target point in each ellipse is measured in SDCM. An SDCM of 1 step means that there is no colour difference between LED chips, 2-3 SDCM means that there is hardly any visible colour difference. Colour consistency of 6-7 SDCM is accepted by the market and in line with the European EcoDesign – US Energy Star requirements. 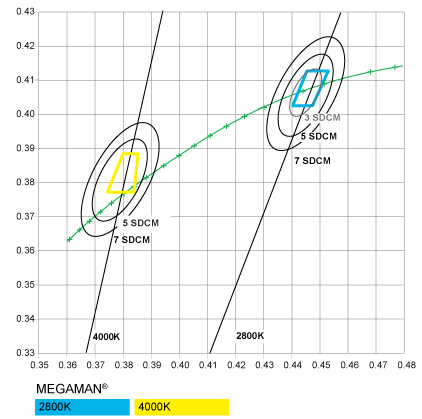 Thanks to MEGAMAN®’s control of the phosphor/LED blend, MEGAMAN® LED professional light sources have a colour consistency of 3-5 SDCM.